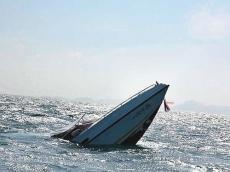 A fishing boat carrying 14 members overturned off east China's Zhejiang Province Saturday afternoon, authorities said, Xinhua reported. Three of them were saved and another 11 remain missing when the accident was reported at 6 p.m. in Xiangshan County, Ningbo City, according to the county government. Maritime and fishery department of the county has sent multiple vessels to search for the missing, and fishery boats nearby have also been mobilized to join the rescue. Identities of the missing remain unknown and investigation of the accident is under way.